Midrand – Fiat Group Automobiles South Africa (Pty) Ltd., importer of Fiat, Fiat Professional, Abarth and Alfa Romeo brand vehicles locally, held its annual Dealer of the Year awards banquet on Friday night. The gala function, held under starry skies at Hayward’s Grand Safari east of Pretoria, saw a number of awards being handed out to the leading dealerships, recognising and celebrating the success of the Fiat and Chrysler group brand dealerships countrywide. 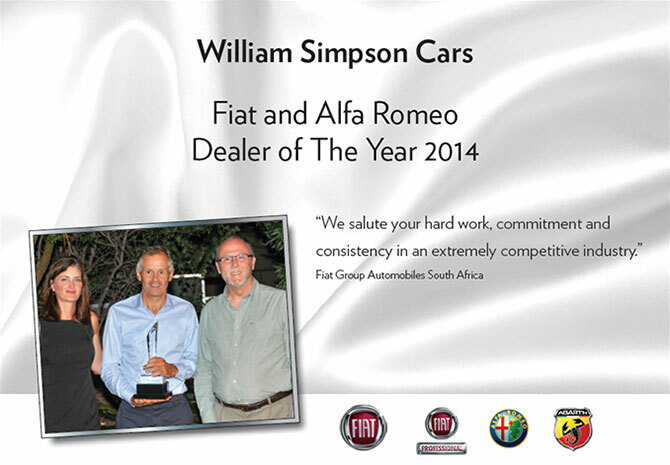 William Simpson Cars is the oldest and most established Nissan, Fiat and Alfa dealer in Cape Town with branches in Tokai and Claremont.